Background and Objectives: Despite the importance of Indigenous drug and alcohol residential rehabilitation, the knowledge supporting these services is limited. This paper aims to: (i) identify the research output related to Indigenous drug and alcohol residential rehabilitation services; (ii) classify identified studies according to their methodology; and (iii) describe key characteristics of clients and services, and critique the research methods. Methods: A PRISMA compliant search of 10 electronic databases for studies of Indigenous drug and alcohol residential rehabilitation services from Australia, United States, Canada and New Zealand, published between 1 January 2000 and 28 March 2016, was conducted. Results: Of the 38 relevant studies, 20 were service descriptions, one was a thesis, 16 described treatment or client characteristics and one was a pre/post evaluation. No systematic reviews or the development or evaluation of measures was identified, with reviewed studies found to be of relatively low methodological quality. 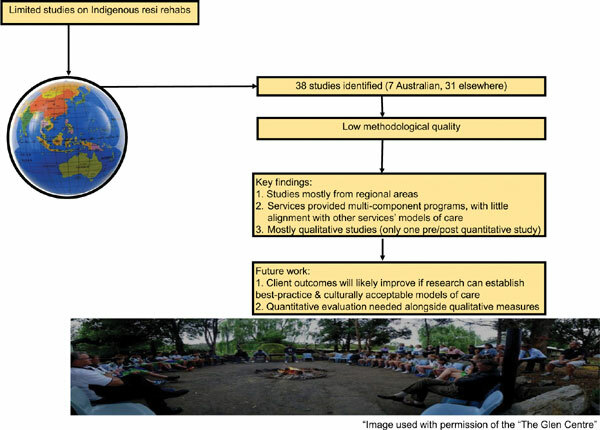 Conclusion: There are few published studies on Indigenous drug and alcohol residential rehabilitation services, an average of one paper per annum internationally, and only one treatment outcome evaluation. Three key features of the reviewed papers included (i) studied services were mostly located in regional areas; (ii) services provided multi-component programs, with little alignment between the models of care of other services; and (iii) the majority used qualitative, rather than quantitative methods. Client outcomes will likely improve if future research can establish best-practice, culturally acceptable models of care and increase the application of evidence-based, culturally validated quantitative evaluation measures to complement existing qualitative research. Indigenous, alcohol, substance use, residential rehabilitation, client characteristics, qualitative research.